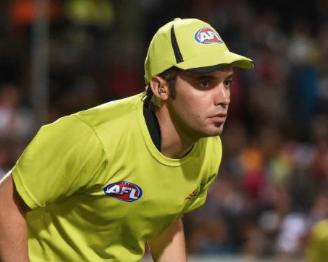 This weekend is a big one for Angus McKenzie-Wills who not only will be officiating his 50thAFL game on Sunday but will be keeping a close eye on the results from the NSW election, wondering if he’ll have a job at the end of it. Angus is a senior policy advisor for the Minister for Transport and his future employment is riding on how voters tick the boxes on Saturday. However, all that will be forgotten when he walks out onto the Sydney Showgrounds to officiate his 50thAFL game between GWS and Essendon on Sunday afternoon. He says that it will probably sink in when he is having a few post-game beers, which his partner on the day Brodie Kenny-Bell might be shouting, if the election results go the wrong way. Looking back, Angus reflected that it’s has been a good time to be umpiring in Sydney during the past three seasons with both the Giants and Sydney playing good football and regular blockbusters coming their way. 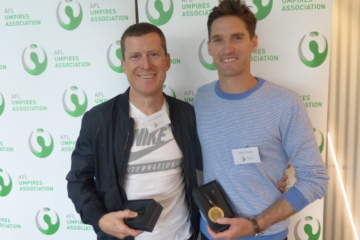 Angus feels his three years on the list so far have helped him settle and learn how to deal with the pressure and expectations of umpiring at the highest level. He now feels more relaxed and is certainly enjoying his football more. His career highlight so far was making the finals panel last year. Angus umpired a final in his first year on the list but acknowledged it wasn’t his best game, so he was determined to make the finals panel again, mainly to prove to himself that the first time wasn’t a fluke. Angus umpired the second elimination final at the SCG with GWS defeating Sydney by 49 points. Even though working as an advisor to a minister can be very mentally demanding, Angus loves the mental challenge of umpiring AFL football. The game is incredibly fast so having to react in a split second and nail a line ball decision is something that gives him a huge buzz. On a lighter side, standing behind the goals certainly gives you the opportunity of hearing some funny comments from the crowd. Once, at Manuka in Canberra, Angus was told his fly was undone. On checking, he realised the bloke in the crowd was having him on and he can still recall the bloke’s laughter afterwards. His most enjoyable game to date was a difficult decision. However, Angus feels the Swans vs Carlton game in the last round of 2017 was his top choice with Buddy Franklin on fire kicking ten goals, including four in the last quarter that all went over his head. He felt it a great way to finish off the year. 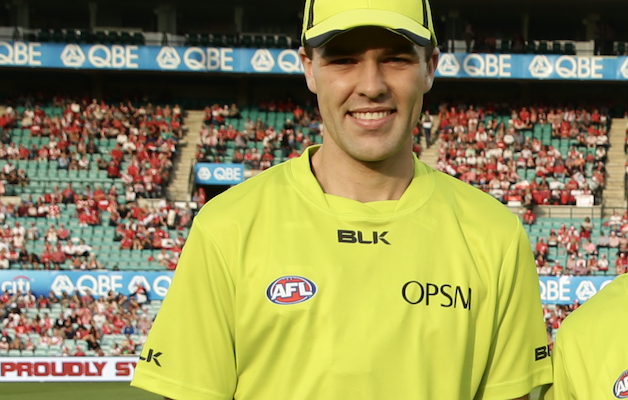 Angus is part of a small but very supporting goal umpiring group in Sydney who, along with the broader umpiring group, congratulate him on his 50-game milestone on Sunday. Have a great game Angus!! !